D2C platform Hargreaves Lansdown enjoyed the strongest asset growth with £16bn in 2017. Good all-round service was the main driver, but it also benefited from the fallout of high-profile problems at other D2C platforms. In percentage terms, Aegon, Aviva and AJ Bell had spectacular growth with 66%, 60% and 36% respectively. Aegon’s growth was underpinned by the ongoing transfer of legacy pension business onto platform. Aviva’s very competitive pricing helped it win substantial business, while AJ Bell’s pension heritage was a siren call for advisers consolidating pension assets. With Q4 gross sales just shy of £33bn, it was the second best quarter on record while annual sales were also a record-breaking £126bn, up 34% against 2016’s gross sales of £93.7bn. Net sales were a buoyant £14.2bn and again second only to the ISA-boosted sales of Q2 2017. Annual net sales were a robust £55.9bn, up an impressive 46% on 2016. 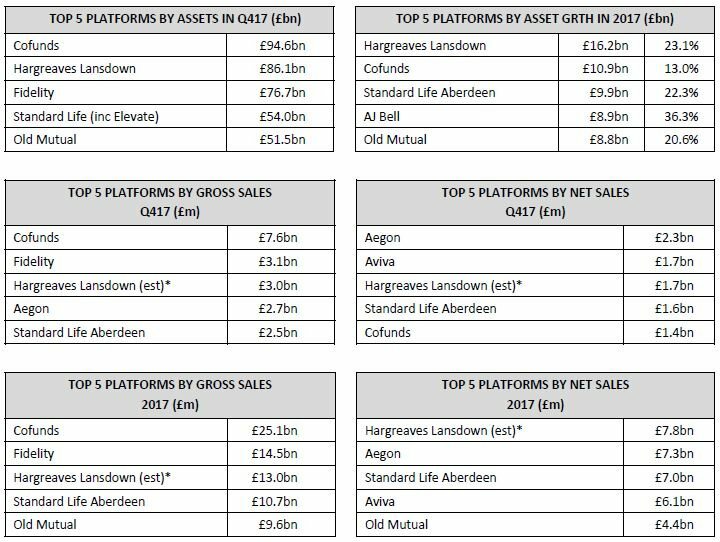 Understandably, larger, mature platforms dominate the gross sales tables with Cofunds leading the charge, but a higher degree of mature assets means these platforms do not always feature in the net sales table. However, a surge in net sales saw Cofunds return to the top five for quarterly net sales for the first time in years. With the Cofunds and Aegon platforms set to amalgamate in Q218, the newly combined platform could be a force to be reckoned with. When looking at pure retail advised business and stripping out D2C, institutional and workplace savings, the picture changes dramatically. Standard Life Aberdeen rises to the top of the table followed by Aviva and Old Mutual. They are joined by independent platforms, Transact and AJ Bell, demonstrating that there is a place for different types of platforms and independence is valued by advisers. Transact was recently admitted to the London Stock Exchange and AJ Bell is set to follow suit during 2018. The Platform Report is a confidential report published by Fundscape LLP. To subscribe to the report, platforms must contribute asset and sales data on a quarterly basis. For further information, please visit www.fundscape.co.uk. *Transact’s net sales are estimated. AJBell provides asset figures only – gross and net sales are estimated.